This morning we did our long run, 5 miles this week. I managed to run the whole thing, and it dawned on me that’s something I don’t think I’ve ever done. It’s an easy thing for me to think back to the glory days when I was younger and ran all over the place. Now, there are some things about those days i may never get back, such as being able to run as FAST for as far as I could then. I’m pretty sure that back then, I could have done it (and we won’t talk about how much quicker I’d have done it in) – I’m fairly sure I walked that long in faster time, but right now it’s not so much whether I could have done it, I just am pretty sure I never had. So I’ll relish the accomplishment. My wife got the picture as I finished up crossing the street out of the park. I was asked how I got started running again, so I thought maybe this milestone for me would be a good lead into that topic. An Abridged History of Ron’s Running. Trust me, you don’t want the unabridged version. Unless you have insomnia. I’ll be pretty brief for the younger years. It started with having to walk to school. 9 miles uphill both ways. Okay, 9 blocks but it felt the same. But if I was running late and trying to run, I found myself getting really winded and just got to where I pretty intentionally worked on increasing how long I could run at one time. I’d run a half block, catch my breath, then try it again. Soon it got to be a full block, a few blocks, then I could run all the way. Of course that’s me trying to run as fast as possible for a distance, I eventually learned to pace myself, and sometimes I wonder why I never went for cross country, as I really enjoyed it. Then came college. And getting a car. And not getting out nearly as much. I could still run a fair bit, just.. didn’t as much. Then came the day when for basketball practice we had to go run a mile. I couldn’t do it. I had to stop and walk, and that devastated me. That’s the last time I even tried it. I don’t know, it seemed like that was when I was gaining weight, and sadly it just became this thing where I was thinking, I’ll never be able to do that again. Those days are gone, you know? It was a pretty long, slow downhill descent for me from there, health and fitness wise. I did decide one year to go ahead and train for an MS150 bike ride back in ’96. Even then, I was pretty sure running would never be in the cards for me again, but a bike I could do. I’d say it ultimately bottomed out the day in the rain that I named this blog after. https://remembertherain.wordpress.com/2013/06/17/remember-the-rain/. A lot of the turnaround for me began when my wife and I were dating. She was training for her second half marathon, and I found that pretty inspiring. I picked up a book on running by Jeff Galloway, and thought okay, maybe I’ll try a little bit of run walking because that’s really how I got started years ago. At the time, that probably wasn’t the best way to go. When you weigh 400 pounds, one step of running can be exhausting. The worst part of it for me was the reverberation. I think that’s actually more of a sound term, but it was like this double whammy. I’d launch forward with a running step, then there was the shock of the landing. If that wasn’t bad enough, there was the after shock of all that fat that was still somewhat suspended landing a split second afterwards. That may have been the first time I really realized just how much back fat I had. It was pretty miserable. It didn’t take long for my knees to say oh no, we’re not going to play that game. I tried again maybe a year later, this time after I’d lost some weight. I was down to about 372 now. I thought okay, I’m going to try the couch to 5k program. Again, my knees said no way. I pretty much figured that may already be my fate, that maybe I’ve just done too much damage and put too much wear on this body by making it try to hold up this weight for so long. I really began to think that a knee replacement was going to be in my future, that it was probably too late to avoid that because of so many years of being soooooo overweight. But I think too that began the process of realizing that I cannot continue to do this to my body, and that this continual yo yo wasn’t going to work. I had a doctor friend suggest that maybe it’s time to think about surgery. Oh, you can bet I fought that one. That just seemed like an admission of failure. I should be able to do this myself, work on it on my own. In fact I told her that, and I think she pretty much asked me how it was working for me so far. She put me in touch with a surgeon and I went to one of his seminars. Three things stand out today about the seminar. First, being introduced to the statistics. Once you get to a certain point, statistics show that for every single diet and exercise program out there, nearly 100% gain all or most of their weight back. I searched all over to find statistics countering that. The most successful study of any program I could find anywhere showed weight loss of 6 pounds over 5 years. When you’re as big as me, 6 pounds just doesn’t cut it. The second things he said was that surgery is not a quick fix, it’s not even a fix. It is a tool that levels the playing field so that diet and exercise have a chance to work. The third thing was that he had one of his former patients there who had ended up running a marathon. I know I was thinking a marathon probably is never in the cards for me, but… even a 5k would be cool. So, September 2010 I had the lapband — a band around the top of my stomach that creates a full sensation immediately when eating. It worked fabulously. I was melting away pounds, and I found that what the doctor said was so true — it was allowing diet and exercise to actually work. My knees were quite a bit happier with me not having to hold so much weight. I started commuting to work and I would get out and walk the last mile in. Then I’d get off a stop earlier to walk further. It got to where instead of riding the bus into the light rail stop, I’d walk the 3 miles instead. And then I hit 300. To me, that was the magic number. I thought… maybe…. maybe my knees would hold up now? They weren’t bothering me any more. 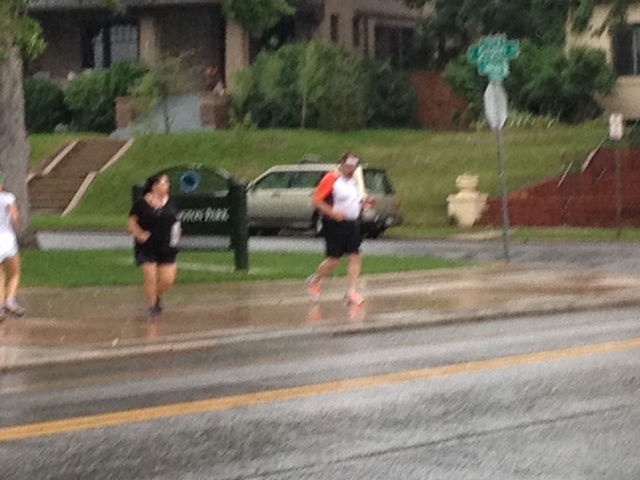 My wife and I registered for the Cherry Creek Sneak, a popular 5K race, and I started the couch to 5K training. I’d run a few seconds, walk a few seconds, for 20 minutes total, three times a week. And I felt okay. Running was still an uncomfortable feeling in some ways, very awkward when you haven’t done it for years. But it got better. The next week, I ran for more seconds at a time, walked for less… it was all pretty much what I was doing as a kid trying to build my endurance so I could run to school (only quite a bit slower). And then week 5, it was 20 minutes of straight running. Which meant, more than a mile. I remember being so incredibly emotional about being able to accomplish that, something I couldn’t do since that day in basketball practice. I ended up running the whole 5K. In the midst of all that training though was a glitch. Suddenly I couldn’t hold down food or water. At all. My lapband had slipped, and had slipped badly and was now pretty much choking off my stomach. I had to get an IV because I couldn’t keep fluids down, and had to have the lapband removed in February 2011. I kept up the training though and ran the Cherry Creek Sneak in April. With my stomach back to normal now, weight gain was a very slow and gradual thing. I kept walking, kept doing some running, did a ton of bike riding. But then last year, I did the Sneak again, and did the Bolder Boulder 10K – but walked both of them. This time, November of last year, I went back in for something much more permanent, called the Sleeve Gastrectomy. Putting it bluntly, they lop off a big portion of your stomach, limiting the amount you can eat at one time. Weight loss has been slower this time around. But the thing that’s been huge for me is once again, I’m better able to move more. I began riding my bike in to work when weather and work schedule permits, and have been able to get back into the running. I ran a full 5K again this spring, and then my wife told me about the class for the half marathon training. I think I surprised her by saying sign me up. And… that brings me to today. Running 5 miles. And feeling amazingly well after all that. I could have kept going, you know? I don’t know how long, I do know I found my legs starting to tire a little. The amazing thing is, though I’m a bit heavier now than when I did the first Cherry Creek Sneak, I haven’t had any real issues yet with how my body is responding. Maybe that comes from better form now… I’m learning our bodies are made for being able to do far more than we give them credit. I think I’ve said that there were times I went back and forth on whether to focus on doing a run walk or whether to try to run the whole thing. I’ve pretty much trained to run it now, and after this morning, 13.1 is starting to look really achievable. This entry was posted in Uncategorized and tagged C25K, Cherry Creek Sneak, Couch 2 5K, Gastric Sleeve, half marathon, Lapband, Weight Loss Surgery. Bookmark the permalink. 5 Responses to Longest. Run. Ever. Thank you for sharing your story! I want to start running, but at my current weight it simply isn’t prudent. My knees would NOT be happy with me. So I am waiting until I drop another 60 pounds before I attempt it. Until then, it’s the recumbent bike and maybe the elliptical for me. 5 miles is a great accomplishment. Congratulations! From my own experience I think there’s wisdom in your approach. I tried too early a couple of times and ended up with my knees hurting for awhile. The bike will strengthen your knees, then I’d move into a lot of walking when you’re getting closer to your goal, then take the next step from there. Isn’t it awesome though to be able to talk about that 60 pounds with expectation instead of wistfulness? Yes it sure is. It dawned on me today that I am only 43 pounds away from my first 100 gone. That is exciting to me.